Purchase at least $7,500 of APC Products within the Rack Mount PDU's, Racks, data Center UPS, Software or InRow Cooling Categories. Purchase at least $15,000 of APC Products within the Surge, Back-UPS or Smart-UPS categories. 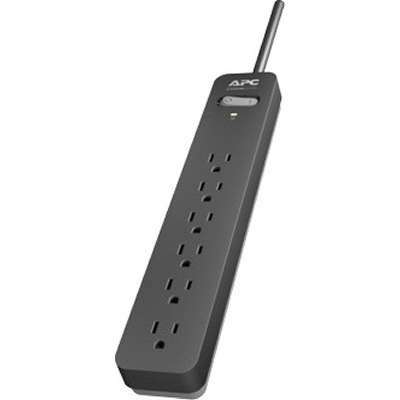 The APC SurgeArrest Essential series represents the primary level of surge protection that should be present on any of your computers and household electronics. Its state of the art circuitry offers protection for sensitive electronic equipment against larger power surges and more common power fluctuations. Six surge protected outlets, status indicator LED lights and our lifetime Equipment Protection Policy make this APC by Schneider Electric product the best value for quality surge protection. As one of the world's largest and most respected power protection designers and manufacturers, APC is relied upon daily for power protection and availability. APC products offer the maximum level of protection, safety, convenience, and reliability. WARNING: Products made with PVC can expose you to chemicals including DEHP, which is known to the State of California to cause cancer, birth defects, or other reproductive harm. For more information go to www.P65Warnings.ca.gov. Shop with confidence! Provantage is an authorized APC dealer.